Not having yellow colour like Nha Trang beach, or brown colour in Vung Tau beach, the sand in Star beach has white colour and smooth like cream. 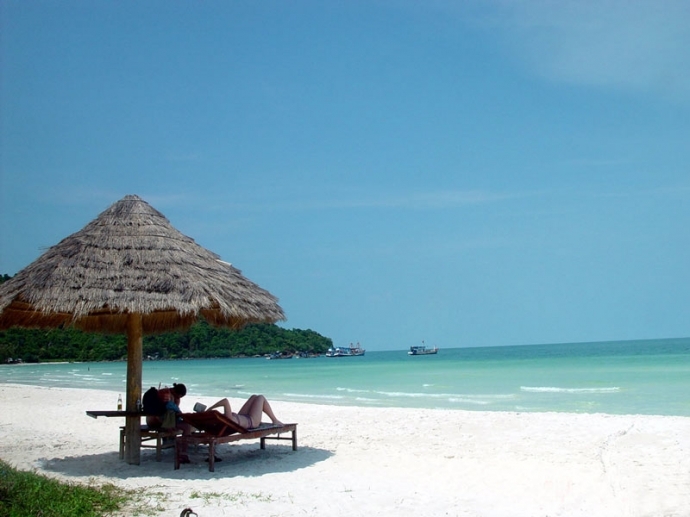 Star beach (bãi Sao) locates in An Thới town of Phu Quoc island district with smooth white sand like cream with the length of 7 km. Star beach locates in warm hands of two slopping mountains bringing peaceful atmosphere and fresh weather. Therefore, Star beach is a favourite destination of couple for honeymoon or families who like private and peaceful atmosphere to relax. In the morning, tourists can walk around on the beach and see the dawn or final sunny of a day which is definitely the most peaceful moment of tourists. The whole island is quite and the perfect place to hire a motor bike and enjoy freedom, peace, quiet and tranquillity. Getting to this fabulous beach isn’t easy, and long may that remain. It’s tucked away on the island’s east coast. There are no signposts but local taxi driver know where it is. The island’s authority is trying to prevent the spread of resorts which would put and end the charm of the place.